The Village Voice announces today its fourth annual 4Knots Music Festival will be held on Saturday, July 12th from 1-8pm at New York City's South Street Seaport, rain or shine. Manhattan's favorite summer music festival will return with over 10 bands hand-picked by the Voice music team. With this year's festival, The Voice continues their 14-year history of curating free, outdoor, all ages live music showcases featuring the most renowned and emerging artists breaking through today's scene.Also announced today, the Official 4Knots Music Festival After Party will take place at Webster Hall on July 12th, immediatelyfollowing the festival. The lineup for this show and tickets will be available soon.Due to Pier 17's redevelopment at the South Street Seaport, The Village Voice strengthened their commitment to the Lower Manhattan location by reformatting the festival's footprint to highlight the Seaport's Historic District. "We value the history and importance of this area to New York City's past, present and future," said Josh Fromson, Publisher of The Village Voice. "By returning to the Seaport, the 4Knots Music Festival is committed to working with local businesses, the downtown community and its visitors to provide an unforgettable free summer music festival for many years to come." 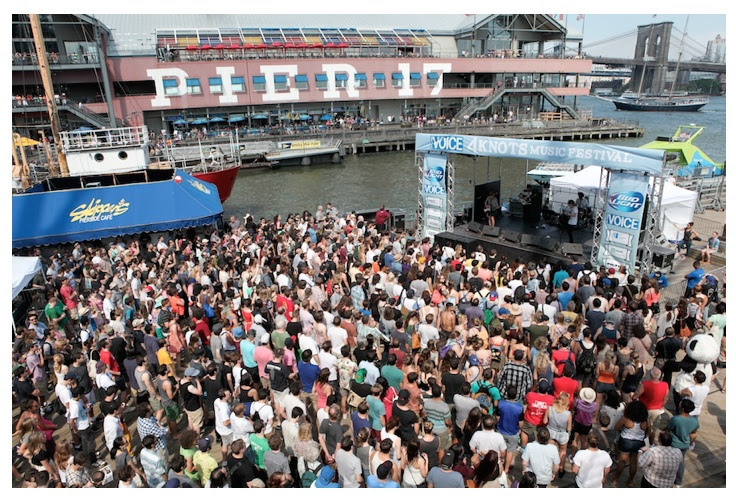 To keep the festival in this area, the 4Knots Music Festival collaborated with the Howard Hughes Corporation, Seaport Museum and the City of New York to make its triumphant return to its home at the Seaport. "South Street Seaport is thrilled to once again partner with the Village Voice on one of New York's premier entertainment festivals. We look forward to another successful 4Knots voyage at the South Street Seaport." - Lincoln Palsgrove, Marketing Director - Howard Hughes Corporation.Similar to last year, this year's festival will feature two stages - located on Pier 16, alongside the iconic New York City landmark Peking VIP Ship and near Pier 17 within the See/Change space at Fulton @ Front Street. This will expand this year's festival northwest and onto the iconic cobblestone streets near the former Fulton Market.Lineup announcements for both the festival and the Webster Hall after-party are set to begin in the coming weeks. The 4Knots Music Festival prides itself on presenting audiences with the best up and coming artists breaking through the scene today. Past performers have included: Kurt Vile & The Violators, The Men, Parquet Courts, Fat Tony, The Black Angels, The Drums, Dan Deacon, Oberhofer, Titus Andronicus, Crocodiles, Nick Waterhouse, Bleached, Archers of Loaf, Delicate Steve, Hospitality, Devin, Eleanor Friedberger, Team Spirit and more at South Street Seaport. Bud Light is returning as the 4Knots Music Festival presenting sponsor.Running between every borough of New York City and culminating near the South Street Seaport, the East River runs at a speed of "4 knots", hence the name of the festival at this unique and historic location.For more information on The 4 Knots Music Festival, please visit: www.villagevoice.com/4KnotsFollow us online for further updates and announcements: www.twitter.com/4knotsfest & www.facebook/4knots.